The ten year treasury yield has been drifting down throughout 2014. The yield started the year at 3% and closed last Wednesday at 2.24%. Daily Treasury Yield Curve Rates There has also been a decline in inflation expectations as reflected in the 10 year TIP pricing. The break-even spread was 2.26% on 1/2/14 and had fallen to 1.82% as of 11/26/14. The break-even spread is widely regarded as the market's prediction of the average annual rate of inflation until maturity. For the ten year TIP, the market's prediction is therefore an annual average CPI rate of 1.82% over the next ten years. The decline in inflation expectations is one reason for the decline in the ten year treasury yield this year. Platts reported that China's oil demand decreased 2% in October compared to September, and was up only 2% for the first ten months compared to the period in 2013. China "has become exactly balanced in oil products trade over January to October" 2014, and "China could very well be a net exporter of oil products this year". China's oil product imports declined 22.2% Y-O-Y in October while oil product exports increased by 30.3%. Crude oil prices were crushed last Friday after OPEC left its production limits unchanged at 30 million barrels a day. Several sources estimate that OPEC members have been exceeding that limit by 700,000 barrels per day. Cheating is common among cartel members. With the oil market saturated with supply, and OPEC unwilling to act as the swing producer, it may take anywhere from 6 months to 2 years before WTI and Brent crude can return to $80 per barrel, and the bottom has probably not be seen yet. Non-OPEC production has increased from 52.76 million barrels per day in 2012 to an estimated 56.03 in 2014, while OPEC production is shrinking. Short-Term Energy Outlook-U.S. Energy Information Administration (EIA) Petroleum consumption in the U.S. has remained relatively steady since 2008 at close to 19 million barrels per day. (click consumption tab: International Energy Statistics - EIA) However, U.S. consumption is well below the peaks hit in 2005 and 2006 prior to the last recession even as oil production has substantially increased in the U.S. The problem is that non-OPEC production, particularly in the U.S. and Canada, is accelerating when petroleum demand is mostly stagnant, and China's demand is slowing down. India's GDP growth slowed to 5.3% in the third quarter, down from 5.7% in the second quarter. Canada's economy slowed in the third quarter to 2.8% from 3.6% in the second quarter, but that was better than expected. 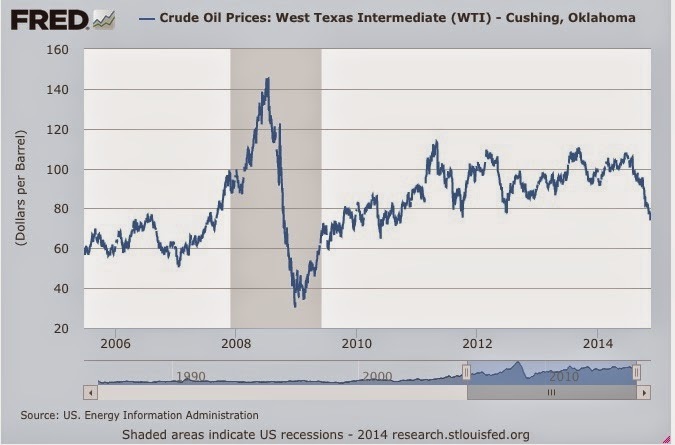 The CAD and Canada's economy will take a hit from the current oil prices. Snapshot of Profit: This snapshot includes the profit realized from a trade earlier this year. The total profit for 2014 is $528.06. Company Description: The Duff & Phelps Global Utility Income Fund (DPG) is a leveraged CEF that invests in utility and telecommunication stocks as well as MLPs. When I bought this 50 share lot, the discount to net asset value was then -12.46%. I suspected that the discount had narrowed to below 9% last Friday which was the case. I currently own 200 shares in a taxable account. Rationale: The primary reason for selling this security is profit taking. There is a strong emphasis on capital preservation in the IRA accounts due to my personal financial circumstances. I am also concerned about the current market price levels of MLP infrastructure companies. Security Description: The Bluerock Residential Growth REIT (BRG) is an externally managed REIT that owns apartment buildings. I view the external management structure as a negative, though it is understandable for small REITs in their early years as public companies. Two of those complexes are located in the Nashville Metropolitan area. I am familiar with 23Hundred At Berry Hill that is a nice complex located in the Berry Hill area of Nashville. A resident could take Franklin Road and arrive in downtown Nashville in about 10 minutes. There is a map at that website. That area of town is in the process of being redeveloped with older structures being torn down. I am not familiar with the other complex, located in Hendersonville, that is north of downtown Nashville. The Grove at Waterford Crossing - Hendersonville, TN That complex is within a few hundred feet of a Cumberland River tributary. Nashville has several lakes and a river. I also looked at the Villas at Oak Crest in Chattanooga, TN; the Estates at Perimeter Apartments in Augusta GA; and the Enders Place at Baldwin Park in Orlando, FL. Bluerock has two complexes under development at Alexan CityCentre in Houston (340 units) and a complex near the University of Central Florida and the Central Florida Research Park referred to as a "296 unit class A multifamily community in Orlando, Florida". I became aware of this REIT last September after reading an article published at Benzinga. The other two REITs, Independence Realty (IRT) and Preferred Apartment Communities (APTS), mentioned in that article, were already owned, and were consequently included in my Yahoo Finance portfolio for that sector basket strategy. That website includes links to articles that are linked to a portfolio's symbols. Dividends: Since the IPO was earlier this year, there is not a long dividend history to public shareholders. Bluerock is currently paying a monthly dividend of $.096667 per share. Bluerock Residential Growth REIT Dividend History-NASDAQ.com It remains to be see how long that rate will remain in existence. Assuming that it continues, which is in no way assured, the dividend yield at a total cost of $12.85 is about 9.03%. Last Earnings Report: One problem in evaluating this new REIT is that there is a lot of noise in its earnings reports. Acquisition and other one time costs are recurring and distorting the FFO and AFFO numbers. 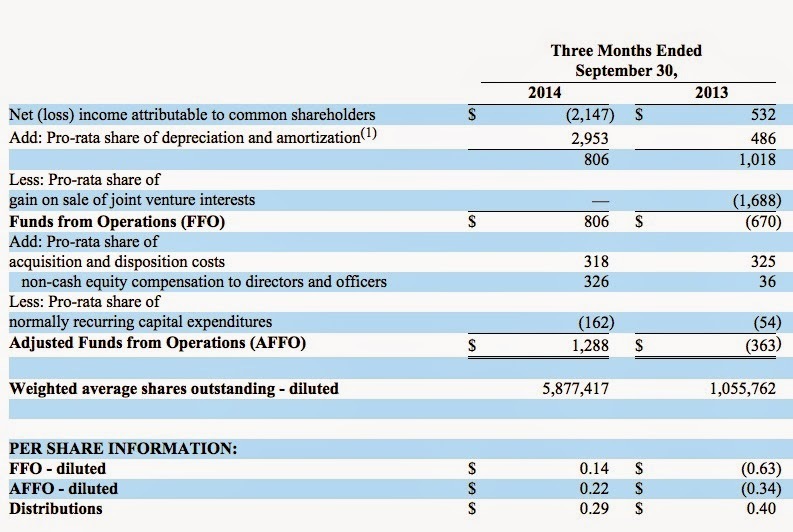 For the 2014 third quarter, AFFO per share was reported at $.22 vs. $.14 per share in FFO. Same store NOI increased by 5.7% from the same period in 2013. At the time of my purchase, the consensus number was -.2 per share for 2014 and $1 for 2015. BRG Analyst Estimates While I am not positive, I believe that the estimate is an AFFO number. 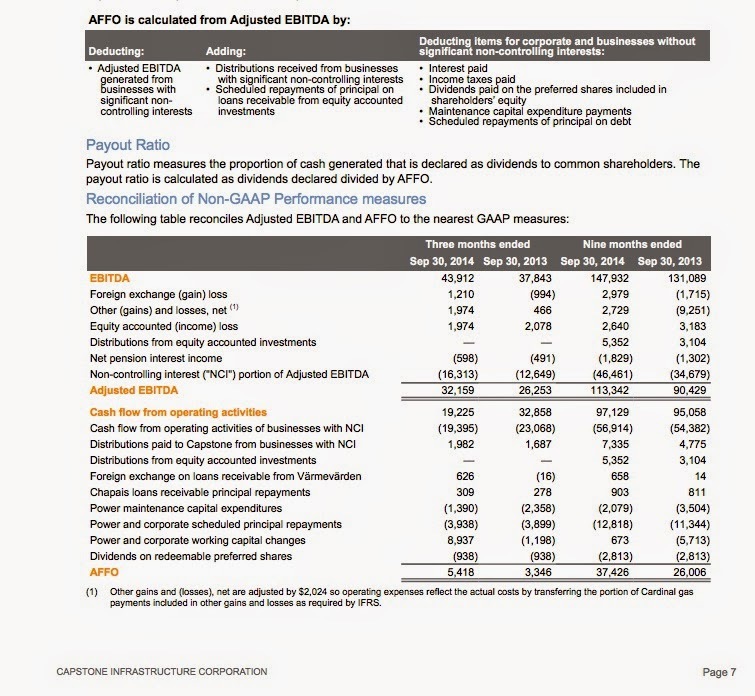 If that $1 AFFO per share is achieved in 2015, the P/AFFO would be reasonable at 12.85. The dividend rate is currently $1.16 per share annually, more than that annual estimate for 2015. For comparison purposes, I would refer to Associated Estates Realty (AEC) that closed at $22.42 last Friday, creating a forward price to funds from operation of about 16.6 using the current 2015 consensus estimate of $1.35: AEC Analyst Estimates AEC is more seasoned apartment REIT. Both have similar forward P/Es to BRG. IRT had a forward price to funds from operations of 10.37 based on last Friday's closing price of $9.44 and a 2015 consensus of $.91 per share. Chart: The stock has drifted down after its IPO price of $14.5: BRG Interactive Stock Chart There was a rally in the shares starting around $11.5 that took the price up to $14+ (early September), but the rally failed as the stock drifted back down to $11.9 before recovering some to its current level. Rationale: Based on the analyst consensus estimate, this REIT is fairly valued and certainly has a good monthly dividend-though it is far from certain for how long the current rate will be maintained by Bluerock. I am primarily an income oriented investor. The income generated by a single security is not relevant. I am interested in the total aggregate cash flow generated by all owned income producing securities, and prefer to see a security pay monthly income that can be aggregated quicker for reinvestment into whatever security hopefully provides the best risk/reward for income generation. Risks: External management structures are disfavored by many REIT investors, including me, and they create a variety of potential conflicts that can work to the detriment of shareholders. The company has an unusually long discussion of risks in a recent SEC Filing. Those risks include the conflict of interest issues created by the external management structure. I do not summarize that discussion of risks since I view it as incumbent on every investor to read that summary for themselves. Until I see several more earnings results, and concrete proof that its recent acquisitions are beneficial to shareholders, I will maintain a light exposure to this stock. The company may continue to issue more stock to fund expansion that will generally cause downside pressure on the price. I view further stock offerings as likely. Future Buys/Sells: I do not have a target price. A rise to $14-$15 within twelve to eighteen months would cause me to consider selling this small lot. I would have to evaluate the then existing conditions. I bought this security in a satellite brokerage account where my default option is to reinvest the dividends to buy more shares. Until further notice, I will be reinvesting the dividend. 3. MOL Matured: Redeemed at $10 Par Value: This is my last Citigroup Funding principal protected note. To simply greatly, MOL was an unsecured senior exchange traded bond, with a $10 par value, that paid a coupon at the greater of 2% or up to 19% based on the price of gold. I received a total of $40 in annual interest payments with the redemption proceeds. When I bought this subordinated "senior bond", it was rated CCC+ by S & P and at B3 by Moodys. At the time of redemption, Moodys still had the bond rated at B3, while S & P had upgraded this bond to B in 2013. I have bought the common shares several times as part of the Lottery Ticket Basket strategy, but do not currently have a position. The third quarter real GDP growth was revised up to 3.8% from 3.5%. News Release: Gross Domestic Product The consensus expectation was for a downward revision to 3.3%. The "current dollar" GDP, the non-inflation adjusted number, increased at an estimated 5.3% annualized rate. 1. Sold 50 PBF at $29.81 (see Disclaimer): This one turned into a quickie trade, take the money and run. I will do both short term trading and long term investing at the same time. I am not likely to hold a stock like PBF long term given the nature of its business. Security Description: PBF Energy Inc (PBF) is a company that owns refineries and has an interest, described below, in a publicly traded LP known as PBF Logistics. Refinery specific information can be found at page 48-49 of the 2013 Annual Report, PBF-2013.12.31.10-K.
PBF Energy announced earlier this year that its Board approved the purchase of up to $200M in shares. 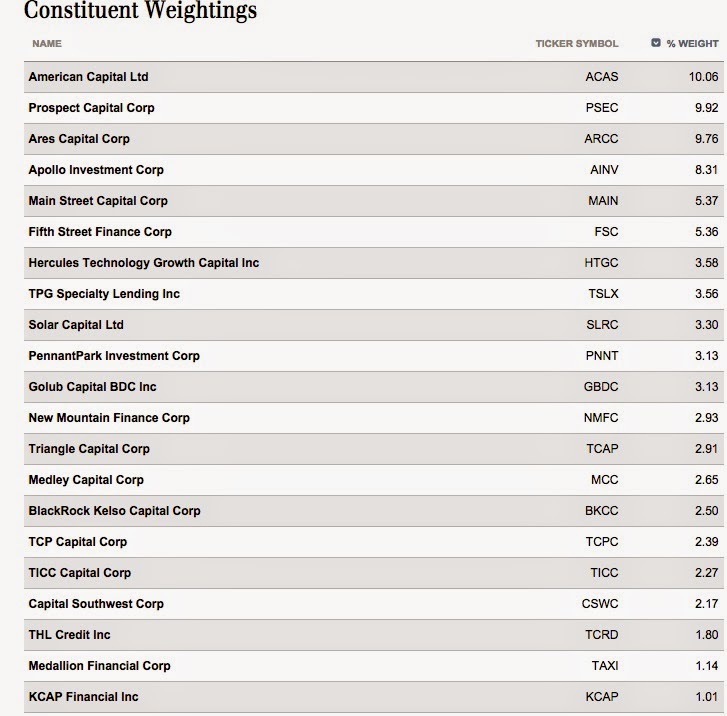 PBF Energy owns indirectly the PBFX general partner and 51.1% of the limited partnership units as of 9/30/14. PBF Energy-2014/9/30.10-Q at page 12 PBFX currently owns some infrastructure assets associated with the refineries owned by PBF Energy, including a Delaware City rail terminal and a truck terminal at the Toledo refinery. Apparently, the intention is to expand into terminals, pipelines, storage facilities and similar logistic assets. PBF Logistics LP Website The PBFX second quarter earnings release refers to owning "modest" amount of infrastructure assets. Some would quibble with the use of the word "modest". Rationale: The last earnings report was good and explains the recent pop in the stock price. 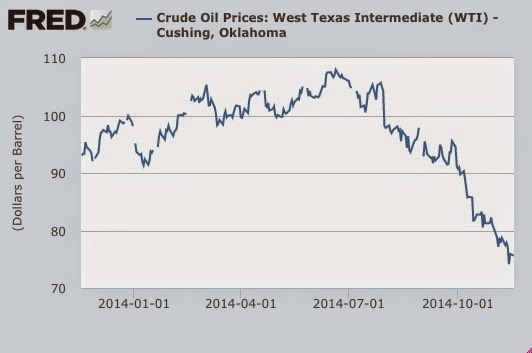 However, refiners are benefiting from what may be a temporary condition, representing the increased spreads between the cost of crude and the price of refined products precipitated by the abrupt and significant decline in crude prices since June and the slower decline in refined product prices. PBF is a relatively new company. To highlight historic earnings volatility, I would refer to Valero, which I have owned in the past but have no position currently. 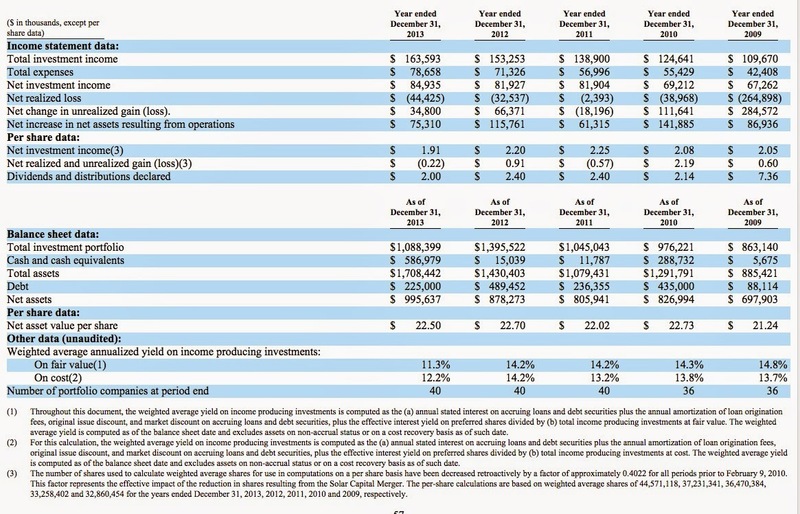 I looked at the 2010 VLO Annual Report showing net income of $4.866B in 2006, a loss of $1.154B in 2008, a loss of $373M in 2009 and a profit of $923M in 2010, Page 22 10-K. That kind of earnings volatility creates risks, as well as significant problems in establishing a fair value for the company. Refiners face numerous risks, as described by PBF in its last SEC filed Annual Report, PBF-2013.12.31.10K, starting at page 19 and continuing to page 35. I would highlight the environmental and regulatory risks (e.g. pages 26-29). I will trade the refiners and have owned at various times, as discussed in this blog, Valero, Delek, and Alon. I have also owned Alon and Valero bonds. I view all of the foregoing as trades. The one year price charts suggest to me at least that these companies are trades only and possibly trades that most individual investors may want to avoid. 2. Added 200 DIR_UN:CA at C$9.03 (see Disclaimer): This security was bought on the Toronto exchange using my existing CAD stash. This purchase was an average down. With 500 shares currently owned, I am at my current risk limit for this security. A sector basket strategy will generally have a $5,000 limit for each component and a $1,000 minimum. These units also trade on the U.S. Grey Market and can be bought with USDs in that dark market. DREUF Dream Industrial Real Estate Investment Trust (DREUF) When the symbol ends in "F", the investor is buying the ordinary shares rather than an ADR. The DREUF shares closed yesterday at $8.0581. I try to avoid the Grey Market, since bids and ask prices are not displayed and volume is usually skimpy or non-existent. If I had no choice but to trade in that market, I would find out the current ordinary share price in its local currency and then do a currency conversion to determine the USD equivalent number. Currency Converter I would then decide on the bid price using only a limit order, probably an AON one. Company Description: Dream Industrial Real Estate Investment Trust (DIR.UN:TOR) is a Canadian REIT that owns light industrial properties across Canada totaling approximately 17M square feet of gross leasable space. As of 9/30/14, the company owned 220 light industrial properties. A list of those properties can be found at Dream Industrial Properties. Occupancy stood at 95.5% as of 9/30/14. Distribution History: This REIT is currently paying a monthly distribution of C$.05833 per share. Investors-Dream Industrial REIT That penny rate was last raised from C$.05625 per share effective for the April 2013 monthly distribution. The company went public in 2012, and its first monthly dividend payment was at $.05081. So, at least there have been increases and no decreases yet, though I would have to admit that the raises so far are not going to pay for my nursing home expenses. At the current penny rate, and assuming a total cost of C$9.03, the current distribution yield would be about 7.75%. While it is immaterial, this security went ex distribution the day after my purchase, so I will be receiving that monthly payment on the entire 500 shares. I received a comment yesterday that my total cost per share was not the purchase price. Instead, I was informed that the total cost number included the brokerage commission. I am still more or less compos mentis and somehow, possibly through divine intervention, recognize that the total cost number includes the commission cost, at least I was so aware earlier this morning when writing this post. Since I started to write a blog back in October 2008, I have expressed dividend yield at the purchase price when discussing a stock, exactly what you would see when looking at a brokerage quote or at a financial website which does not factor in a commission rate. When I take a snapshot of the profit or loss, then that number will include the impact of the round trip commission cost. For the first nine months, the AFFO number was $.592 and the FFO number was reported at $.704 on a diluted basis. When there is that much difference between the FFO and AFFO number, I will use the lower number in calculating dividend coverage and the price to funds from operations. For ease of calculation, I will use in the P/AFFO calculation an assumed $.20 AFFO number for the current quarter, bringing the yearly number up to $.792. At a C$9.03 price, the P/AFFO is reasonable in my opinion at 11.4. As of 9/30/14, leverage was at 52.8% "with interest coverage of 3 times and a weighted average term to maturity on debt of 4.1 years". The weighted average "face" rate on all debt was 4.11%, with an effective weighted average rate of 3.86%. REITs have benefited from the abnormally low interest rates when refinancing their mortgage obligations or their debt at the corporate level. Commercial mortgages tend to be around 5 years so the worm will turn the other way down the line. One important deduction is the amount set aside for recurring capital expenditures. I would not want to see a REIT funding a dividend out of that money. Rationale: I have raised my Canadian cash stash to over C$30,000 after harvesting profits on a number of Canadian securities earlier this year, including some Canadian REITs. Those funds earn nothing until I invest them. One purpose in my Canadian Dollar Strategy is to increase my CAD stash through dividends paid in CADs and profits realized in CADs. I am also diversifying my assets some out of USD priced securities for diversification purposes. I do not want to incur another 1% fee for converting USDs into CADs so I am building up my CAD position through profits realized in CADs and in dividends paid in CADS. Since I am a long term owner of CADs, I am not concerned about the currency risk. If and when 1 CAD buys $1.25+ USDs, then I will consider transferring some of those CADs back into USDs. Until that time happens, and it may never happen in my lifetime, I am concerned about generating a return on my Canadian Dollar position rather than how many USDs can be bought with those CADs at a particular point in time. Dream Industrial seems like a well run REIT to me. The dividend yield is good at close to 7.75%, even without any additional raises. The P/FFO is reasonable in my opinion. I have some rational prospect for a capital gain in addition to the dividend stream. In the following risk discussion, I mention the currency risk issue. Many investors may prefer to avoid that risk altogether and focus solely on U.S. REITs. While currency exposure adds a layer of risk, without question, there is also a potential benefit. The CAD may rise against the USD above where it was yesterday, and consequently contribute to the total return. If one CAD bought 1 USD, a level exceeded slightly back in January 2013, CAD/USD, then the value of the USD price DREUF would be about 12% higher than now with no change in the ordinary share price of C$9.1 as of 11/25/14. I described in 2010 how the purchase of AXA's ADR met both of those conditions. The ordinary shares priced in Euros had declined 27.2% and the Euro had declined in value against the USD, creating an overall 43.33% decline for the period measured in that post. Stocks, Bonds & Politics: Bought 100 AXAHY at $14.69. If you look at a five year chart of the EUR/USD, then you will see what I saw in the 2010 summer. The Euro had declined from around 1.49 in November 2009 to approximately 1.22 in late May/early June 2010. Since currency trends can last for awhile, hard to say when there will be a reversal in favor of the foreign currency, I will generally slowly accumulate those foreign securities, possibly averaging down when I view it to be both rational and prudent. Risks Highlighted by the Chart : The stock has been weak for several weeks and has never really recovered from the downdraft in REIT stocks that occurred last year when interest rates started to rise. The stock was selling below its 200 and 50 day SMA lines when I purchased shares, though the 50 day SMA line was just slightly above the closing price on the day of purchase. (C$9.16 vs. C$9.10 close on 11/25). That risk would also apply to an investor who exchanges USDs to buy CADs in order to complete a purchase in Toronto, unless there was the intent and the wherewithal to convert back when there was a profit to be made on the exchange after fees. Normal Risks for Stocks: Needless to say, the potential for a 10% annualized return, achieved mostly with a 7.75% distribution yield, is not a risk free endeavor. I could lose money on the stock even after holding for a long period of time. The dividend could be cut during a recession or even eliminated during a Depression. Generally, though, I believe that it is probable, though not certain of course, that I can achieve that bogey by simply waiting for the stock to pop after collecting several dividend payments, assuming that I wish to harvest the gain at such a propitious time. Prior to last year's downdraft in the REIT sector, Dream Industrial did hit C$11.6 back in January 2013 or 28.46% above my last purchase price. If I harvested say 3 years of dividends and then could sell anywhere between C$11 to C$11.6, that would be a satisfactory outcome. Company Discussion of Risk: Corporations will generally describe the risks incident to their operations in an Annual Report. The Dream Industrial 2013 Annual Report has a section, starting at page 32, titled "Risks and Our Strategy to Manage Them". Tax Risk Issues For Lack of a Better Description: I only know what I have been told by my broker and by those who appear to know the answers. I am buying a Canadian security on the Toronto Exchange using CADs to buy the shares and receiving CADs when I sell the shares. My dividends are paid in CADs. I am a U.S. citizen and taxpayer. The I.R.S. is not interested in reporting profits and income in CADs. Instead, the broker converts the value of the CAD into USDs when I buy and sell. If the value of the CAD declines between those periods, I will have a greater profit in CADs than what is reportable on my tax return, or possibly more of a loss, or somewhere in between including a profit in CADs and a loss for U.S. tax reporting purposes. The CAD dividend is likewise converted into USDs. The practical implications are shown when I sold two Canadian REITs recently. SOLD: 300 HLP-UN:CA at C$14.17 and 300 AX-UN:CA at C$15.71 In both cases, my reportable tax profit was less than the profit actually realized in CADs. That is just one nit. I also apparently create a tax event when I sell CADs, which now have differing USD costs, to buy a security on the Toronto exchange. So I am creating some issues by electing to buy securities using a foreign currency: 1. the commission rate is higher, 2. there are several tax issues, and 3. fees are normally charged for the initial conversion of USDs into the foreign currency. Sources told Reuters that China is prepared to cut rates against due to concerns about deflation accelerating debt defaults. Markit reported its flash service PMI at 56.3 for November. Some pundits are predicting that there is a 60% chance that OPEC will cut production during its meeting later this week. I have no idea, and everyone appears to be guessing in my opinion. My guess would be 50/50. In case there is a production cut, and Brent Crude spikes to over $80, I wanted to have a few Lottery Tickets that might benefit significantly with a change in perception about energy prices. The crude oil price decline was significant, swift, and unexpected, and caused a bone crushing share price decline in energy stocks. I try to keep things in perspective. I then used the Bloomberg currency converter to calculate the USD value of 2.38 GBP. Dividends: Premier has paid an annual 5 pence per ordinary share during 2013 and 2014. Shareholder Information | Premier Oil At the time of my purchase, 5 pence was worth about USD$.0785. The dividend yield at that conversion rate would be about 2.12% at a total cost of $3.7 per share. The low dividend yield is one reason for the LT classification. Rationale and Risks: According to Bloomberg, the P/E based on estimated 2014 earnings is less than 7, with a price to book of less than 1 using the current estimates and market price per share. The estimated P.E.G. is about .33. I will frequently make Lottery Ticket purchases based on that type of statistical data that is accompanied by a smashed stock price without thinking too much. Since the ordinary share are ultimately priced in British Pounds, the decline in GBP will flow through into the USD priced ordinary shares. GBP/USD Interactive Stock Chart The recent decline in the GBP has resulted in the USD priced ordinary shares underperforming the ordinary shares priced in Pence by close to 5% over the past 3 months. Future Buys/Sells: I am not likely to buy more shares. I do not have a price target. I would consider selling this 80 share lot when and if the shares return to the $5 to $6 range or after a material deterioration in its operations. I noticed when researching material for my recent post discussing BDCL that Solar Capital was selling at an unusually large discount to its last reported net asset value per share. After researching this company, I placed it in the Flyer's Basket risk category due to its declining weighted average net yield on its income producing investments, the current payout in excess of its net interest income per share, the external management, the prior dividend cut, and the usual assortment of risks inherent in BDCs. Company Description: Solar Capital Ltd. (SLRC) is an externally managed BDC that targets investments in U.S. firms with EBITDA between $20M to $100M. A list of investments can be found starting at page 7 of the last SEC filed Form 10-Q. Another reason is yield compression, as the weighted average annualized yield drifts down and has continued to do so in 2014. That is a common problem with BDCs now, and many will reach for yield by making riskier loans further down in the capital structure. Solar appears to be sticking mostly to senior secured loans which may result at some point in a dividend cut. As of 12/31/13, Solar had 17.9% of its total assets invested in another company called Crystal Capital Financial Holdings LLC (page 15, Form 10-K). A 98% interest in Crystal was acquired in December 2012 for $275M in cash (page 61). On March 31, 2014, Solar "exchanged" $137.500M of its "equity interest" in Crystal for floating rate senior secured notes issued by Crystal bearing interest at LIBOR plus 9.5% and maturing on 3/31/19 (page 29, Form 10-Q). I was initially perplexed by that last sentence, since the same document shows the investment in Crystal to be worth $300M as an equity investment based on a $275M cost number with no mention of that senior secured note in the debt section (page 7 lists senior secured loans as of 9/30/14, page 8 lists equity investments:Form 10-Q) The treatment has to do with Crystal being consolidated with Solar, as clarified by the CFO in the last conference call during the question and answer session. 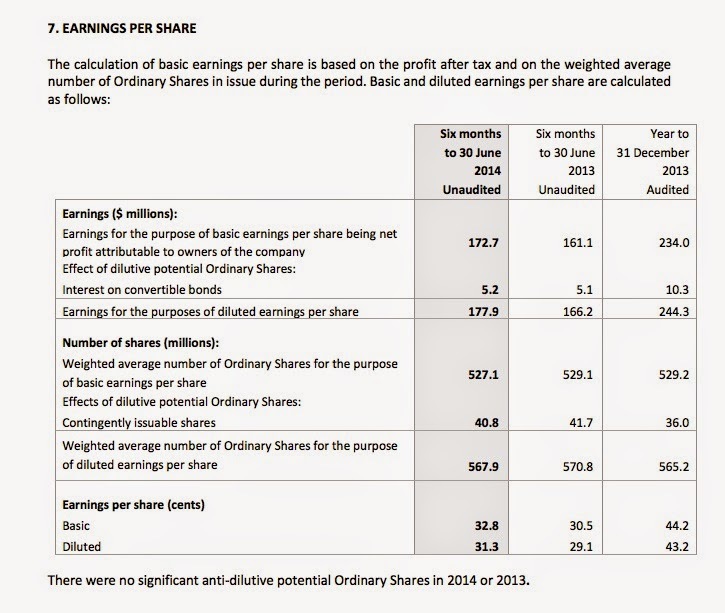 Dividend: The quarterly dividend was cut from $.6 to $.4 per share in 2013. This occurred after received $237M in proceeds after monetizing three investments. News Release The company subsequently announced in July 2013 that the Board had approved up to $100M in stock repurchases. Press Release July 2013 After purchasing approximately $17.5M in stock, the stock repurchase program was extended in December 2013. The share repurchase program expired in July 2014 with approximately $56.6M in shares repurchased out of the $100M authorized by the Board. The dividend yield at a total cost of $18.38 per share is about 8.7%. Unless there is an improvement relatively soon in the quarterly net investment income per share, I would view a dividend cut as a possibility. Possibly, the new joint venture with PIMCO will increase the NII per share some. Chart: SLRC's share price is near the 52 week low set in mid-October, and is trading under its 50 and 200 day SMA lines: SLRC Interactive Stock Chart The 200 day line was at $20.57 according to Yahoo Finance's chart as of last Friday. The historical high prices were hit slightly over $25 in March 2011 and again in January 2013. Net asset value per share was reported at $22.24 as of 9/30/14. Prospectus Supplement The $18.38 purchase price was a 17.8% discount to that last reported NAV per share. The fair value weighted average yield of Solar's income producing investments was 10.3% at the quarter's end. This number has been trending down, as noted above. 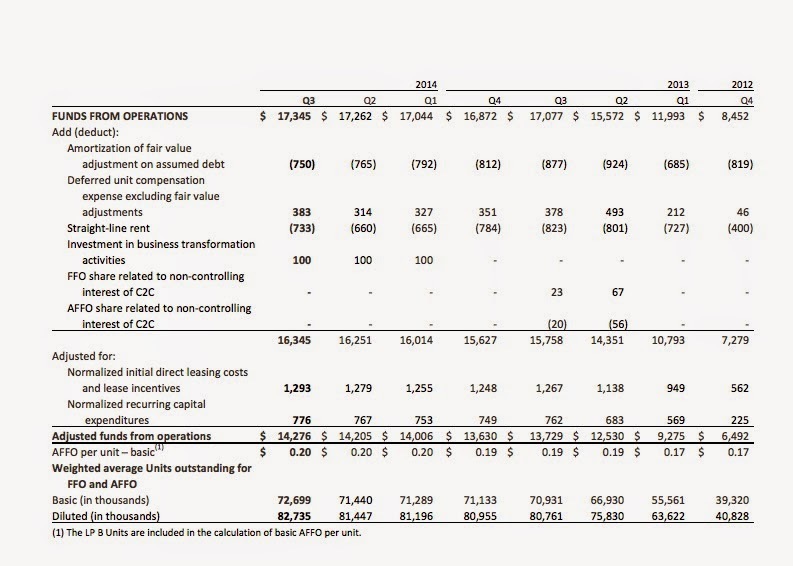 The company had 67.2M in cash and $490M in unused credit capacity as of 9/30/14. Rational: The primary reason for investing in a BDC will be to harvest the dividend and to hopefully escape with a profit on the shares. The general hoped for goal is an annualized total return of 10%+. The company has not been a serial issue of stock so far, one of the common complaints that I have about several other BDCs. I was looking at one last night that has had four stock offerings in the past 12 months. 1. Company Discussion of Risks: I would recommend that anyone investing in a BDC read the summary of risks found in an SEC filed Annual Report. Solar discusses risks incident to its operations starting at page 23 of its last SEC filed Annual Report: Form 10-K Among those risks, Solar states that there "are significant potential conflicts of interest which could impact our investment returns" (page 44). 2. Risky Portfolio: This risk is common to BDCs. These companies are basically lending money to mostly private firms that would find it difficult to obtain needed capital from banks. Some of the borrowers may be relatively new with little or no track record, heavily indebted companies that have gone private after a leveraged buyout, or older companies that have fallen on hard times. The loans will generally carry high interest rates and will sometimes have an equity kicker such as a stock warrant. One does not need to be a professional loan officer to recognize the risks. 3. Always a Potential for a Dividend Cut: The main reason for buying this security is the dividend. If the portfolio suffers losses and defaults, a dividend cut is certainly a possibility. A recession would increase the odds of a dividend cut. I am concerned about another dividend cut unless Solar can increase its NII per share. The last quarter had a NII of $.39 and a quarterly dividend of $.4. 4. Unfavorable Chart: The chart indicates some dissatisfaction with Solar. Perceptions are sometimes hard to change. Perhaps, the only way for Solar to return to good graces is by posting both increases in NII and net asset value per share. BDCs are dependent on securing and maintaining favor with individual investors, many of whom pay no attention to net asset value per share numbers and focus solely on dividends. Solar has a relatively low dividend yield compared to other BDCs, partly due to its decision to hold cash after several investments were redeemed, as noted above, and to use some of that cash surplus to buy back stock. In an exchange with an analyst from Wells Fargo, Gregory Nelson, who inquired why Solar had not invested the surplus cash, the Chairman and CEO Michael Gross made an interesting comment. The external managers had not received an incentive fee in 2014. If they invested the cash in "liquid loans", then the "incremental investment income will effectively flow to our benefit as the investment manager", apparently due to clearing the hurdle for triggering payment of the incentive fees, Q3 2014 Results - Earnings Call Transcript | Seeking Alpha. Future Buys: I am not likely to buy more. I will consider selling when and if I can harvest a 10% annualized return or there is a material adverse change in Solar's operations. 3. Bought 50 ENY at $13.55 (see Disclaimer): I am not classifying this purchase as part of the Flyer's Basket strategy. Instead, I am just being very cautious with my entry points with this ETF having sold 155+ shares at $17.55. 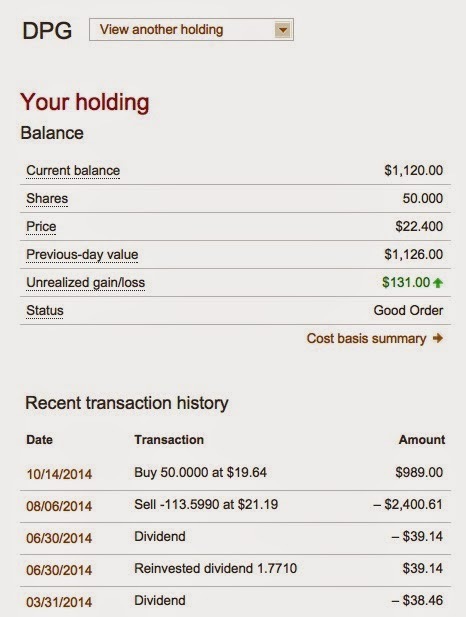 Sold 155+ ENY at $17.55 (7/5/14 Post) I realized a $293.37 gain plus the dividends. If I still owned those shares, I would not have a profit but a loss. By eliminating the position at $17.55, I now have the luxury of buying shares back at a lower price, a typical small ball approach to investing. Given the uncertainty about what OPEC might do later this week, I decided that caution was prudent. Investors perceive many Canadian oil sands producers as unprofitable or barely profitable at today's crude prices. If the per barrel prices for WTI and Brent continue to slide down into the 60s, the Canadian energy stocks will continue to suffer. I sold out of ENY on 6/23/14. This ETF had declined $4 per share since then or 22.79%. That is bear market territory and pretty severe for an ETF in 5 months. So far, as shown by snapshots in the preceding linked post, I now have realized gains of $617.03 after nibbling at this ETF, sometimes flipping 50 or even 30 shares. 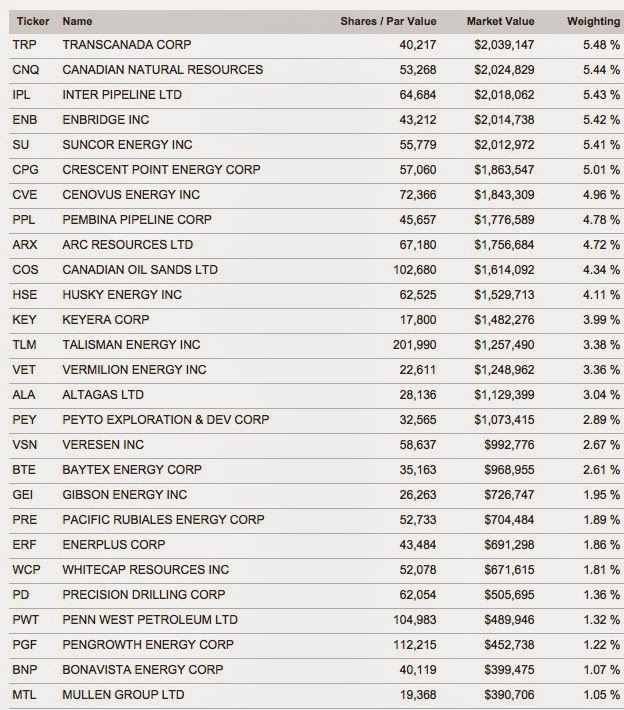 Security Description: The Guggenheim Canadian Energy Income ETF (ENY) is an ETF that owns Canadian energy companies. The fund has changed its stripes some since I first bought shares several years ago. The fund now has a significant weighting in storage and transportation stocks at 27.42% as of 9/30/14. Those stocks would include TransCanada, Enbridge, Pembina, and Inter Pipeline. I am going to wait until OPEC acts to decide whether to average up or down or do nothing. The WSJ reporter who covered China since 2011 wrote a negative article about that nation's future prospects. WSJ He refers to the ghost cities dotting the landscape and the downturn in real estate development that had been a driver for GDP growth. He concludes that "we are witnessing the end of the Chinese miracle", and we "are seeing just how much of China's success depended on a debt-powered housing bubble and corruption-laced spending". I am more concerned about a hard landing in China than the stagnation in Europe and Japan. I have never expected Japan and Europe to be significant contributors to worldwide GDP growth. The question is usually whether or not those countries are deadweights or minor contributors. Worldwide GDP growth is dependent on continued acceleration in developing countries and 2%-3% real GDP growth in the U.S. It would certainly be helpful for the Northern European countries, Canada and Australia to grow at about the same rate as the U.S.
Jack Hough wrote an article in Barron's arguing that Intel has 30% more upside. My small position in Intel, with an average cost of $15.52 per share, has become bond like for me. After harvesting profits, I am simply interested now in Intel increasing the dividend which increases my "bond" coupon based on that constant cost number. 1. Bought Back 100 MCQPF at $3.632 (Lottery Ticket Basket Strategy)(see Disclaimer): I was allowed to exceed the $300 limit by up to $126.25 due to a prior realized gain. I bought the ordinary shares traded on the U.S. pink sheet exchange using USDs. This prior purchase was not a Lottery Ticket. The stock has been demoted to the LT category. The price decline explains why without knowing what caused this stock to go from $7.18 to $3.63 in a strong bull market. Company Description: Capstone Infrastructure (MCQPF) is a Canadian company that has investments in gas co-generation, wind, hydro, biomass and solar power generating facilities as well as interests in a U.K. water utility (Bristol Water) and a district heating business in Sweden. The Canadian generation has a capacity of 449 megawatts and Capstone is developing another 79MW of wind generation in Ontario and Quebec. Capstone The largest is the Cardinal Power plant with a nameplate capacity of 149MW that uses gas turbines. The most recently completed facility is the Skyway 9.48MW wind farm. A list of those facilities by category can be found at Capstone. Capstone has a 50% interest in Bristol Water, a regulated U.K. water utility operating in the Bristol region and serving a population of more than 1.1M people. The company owns a 33.3% equity interest in a district heating business operating in Sweden and providing power to residential customers in 10 communities. The company is currently paying a quarterly dividend of C$.075. On the positive side, the CAD priced shares stopped cascading down in December 2011, stabilizing just north of C$4. Over the past two years through 11/21/14, the USD priced shares have significantly underperformed the ordinary shares priced in CADs due to the decline in the CAD's value versus the USD. That differential highlights the currency risk issue for a U.S. investor using USDs to buy the ordinary shares or converting their USDs to CADs in order to buy shares on the Toronto exchange. For a U.S. investor who buys the USD priced MCQPF, the dividends will be paid in USDs after conversion from CADs and after the applicable withholding tax. The company reiterated its 2014 estimate adjusted EBITDA target of between $150M to $160M. Long term debt as of 9/3014 was $887M which included debt owed by Capstone and its proportionate share of debt owed by Bristol Water and power assets. Rationale and Risks: The primary reason for owning this security is to harvest the dividend and hopefully exit the position with a profit on the shares. A long term chart will frequently highlight the risk, which is the case for this stock. Another similar company has already run into trouble, Atlantic Power (AT), and is currently attempting to sell of some assets. Atlantic Power Corporation Releases Third Quarter 2014 Results I have an unrealized loss for a LT purchase in AT, having gone to the well one too many times. Bought 50 AT at $4.08 (9/30/13 Post) Atlantic Power slashed its monthly dividend last year. AT Dividend History A few weeks ago, AT went from a monthly dividend of $.0333 per share to a quarterly dividend of $.03: Atlantic Power Corporation So one risk is that Capstone will end up following the same path. Prior Trade: The prior trade which resulted in a $138.71 profit, is reflected in the preceding snapshot. I am trading the ordinary shares traded on the U.S. pink sheet exchange using USDs. 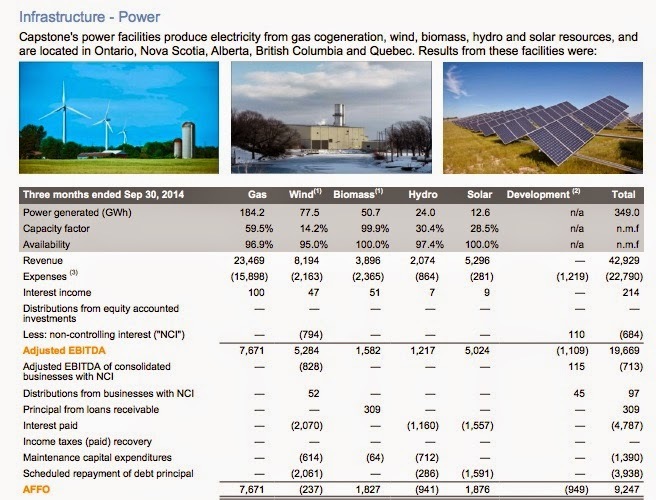 Power Corporation of Canada has a 65.8% interest in Power Financial. Power Financial 2014 1st Quarter Earnings Report (net earnings of C$467M, up from C$394M in the 2013 first quarter). Power Financial owned 67% of Great West Lifeco's common shares and 58.6% of IGM Financial's common shares. IGM also owned 4% of Great West Lifeco's common shares; and Great-West Lifeco owned 3.6% of the IGM's common shares. So Power Corporation of Canada directly controls Power Financial and consequently has an indirect controlling interest in Great-West Lifeco and IGM Financial. IGM Financial is a financial management company. Power Corporation of Canada is profiled in a recent Motley Fool Article. Rationale: I mentioned when buying these shares that this would be a trade. Eventually, I may buy the ordinary shares on the Toronto exchange and hold for a longer period. 3. Bought 40 BDCL at $23.53 ($500 to $1,000 Flyer's Basket Strategy With Snapshots of Round Trip Trades)(see Disclaimer): I am surprised that I even nibbled on this security. BDCL combines several items that I do not like in one security: an ETN that uses leverage to track an index of BDCs. My stomach just became queasy just writing those words all at once. This is a trade. I bought near the close using a limit order. Security Description: The 2xLeveraged Linked to Wells Fargo BDC Index ETN (BDCL) is an unsecured debt obligation issued by UBS that provides a monthly compounded two times leveraged long exposure to the Wells Fargo BDC Index. That index is a float adjusted, capitalization-weighted index of all NYSE and Nasdaq listed BDCs that have a market capitalization of at least $100 million at the time of inclusion in the index. This security is an exchange traded senior and unsecured note, otherwise known as an ETN. The owner is exposed to the credit risk of UBS: UBS AG Stock Price; Last SEC Filed UBS Annual Report 20-F. UBS senior unsecured debt is currently rated A2 by Moody's and A by Fitch according to FINRA. 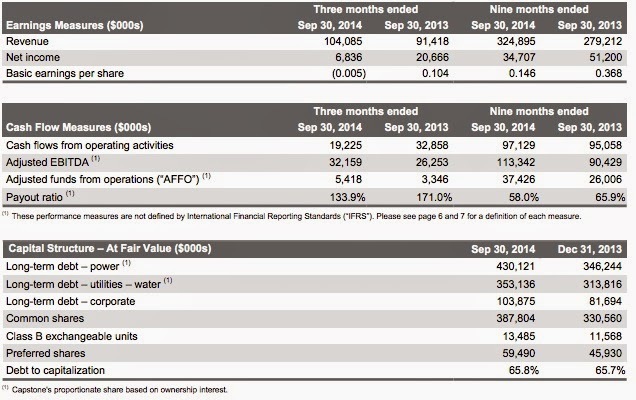 The fact sheet shows the UBS credit ratings, as of 11/30/13, at A2, A, and A by Moody's, S & P and Fitch respectively. I have relatively small positions in PSEC, ARCC, AINV, FSC, PNNT, BKCC, TICC and KCAP. I will trade those positions under clearly defined rules, where I will at least make an effort to realize a total return greater than the dividend yield at my total cost per share. That goal is far easier said than done. The general rules applicable to externally managed BDCs are to consider buying when the market price falls below the net asset value per share and to consider selling when the market price exceeds NAV per share by 5%. I will make exceptions to those general guidelines. This ETN is discussed in a Seeking Alpha published last September. Dividends: This ETN has been paying a variable quarterly distribution. BDCL Dividend History-NASDAQ.com The four quarterly dividends paid in 2014 total $4.1373 per share. At that rate, the dividend yield would be about 17.58% at a total cost of $23.53 per share. Rationale and Risks: The main reason for buying this type of security is to harvest one or more dividends and then escape with a profit. If BDCs do improve in price over the coming weeks or months, then I have a cushion to hold onto BDCL longer and to harvest more than one dividend. The best possible outcome from my perspective, as a conservative investor, would be to harvest 4 dividends and to escape with a profit selling the shares. This is a trade, not a long term investment for me. This trade is partly based on the fact that the share prices of several BDCs have declined significantly this year, creating larger than normal discounts to net asset values per share for several externally managed ones. The price downtrend has occurred with interest rates declining, which makes the BDC yields more attractive compared to alternative income investments particularly junk bonds. All of the foregoing BDCs are externally managed. BDCs, particularly the externally managed ones, have been beaten up this year. One reason may be related to being kicked out of the S & P and Russell indexes earlier in the year. Investors may have also soured on several of them due to persistent share offerings. Persistent weakness in share price can be self-sustaining even when it makes no sense at a certain price level. Last Friday, for example, the price of TCPC was knocked down 4.12% after that BDC launched a share offering, Pricing Sheet. That BDC has an ATM offering prospectus outstanding for up to $100M, Prospectus TCPC had another large offering back in July 2014, Prospectus, priced to the public at $17.3. Yet another offering was made in December 2013, Prospectus. At least the public offering price in those sales was above TCPC's net asset value per share. I am hoping that these stock will receive a bounce during the 2015 first quarter, as some of the selling pressure subsides. For externally managed BDCs, it would be most helpful simply for their market prices to converge to their respective net asset values per share. Maybe some of the worst offenders could actually increase their net asset value per share for a few quarters. The discounts to net asset values has expanded significantly for several of them, including FSC, PSEC, and TICC. The prospectus can be downloaded from the sponsor's website. A summary of the risks starts at page S-20 and ends at page S-31. The sponsor also summarizes risks at its website under the "key considerations" tab. I view this security as extremely risky which explains why I place it under the restrictions of the Flyer's Basket Strategy. BDCL does incur short term borrowing cost. A rise in the 3 month Libor rate, which will happen when the FED starts to raise the federal funds rate, will increase the borrowing costs and negatively impact the total return. Leverage works both ways. If BDCL successfully goes up twice the value of the index after fees and expenses, it will also go down twice the value of the index's decline. The decline in the BDC sector has caused BDCL to post poor total returns numbers YTD and over the past year, which include reinvestment of the dividends. Morningstar calculates the YTD and 1 year total returns through 11/21/14 to be -7.61% and -6.96% respectively. The total annualized return over 3 years is +30.18%. Based solely on tax considerations, it would make more sense to own this security in an IRA. I did not see any tax information at the sponsor's website, but I am assuming that all of the dividends would be taxed at ordinary income rates rather than at the qualified dividend rate. However, I view BDCL to be too risky for a retirement account and consequently bought the shares in a taxable account. Several externally managed BDCs have a history of destroying the net asset value per share number. This is particularly important for a long term investor since the market price tends to hug the NAV per share number within a few percent above or below. 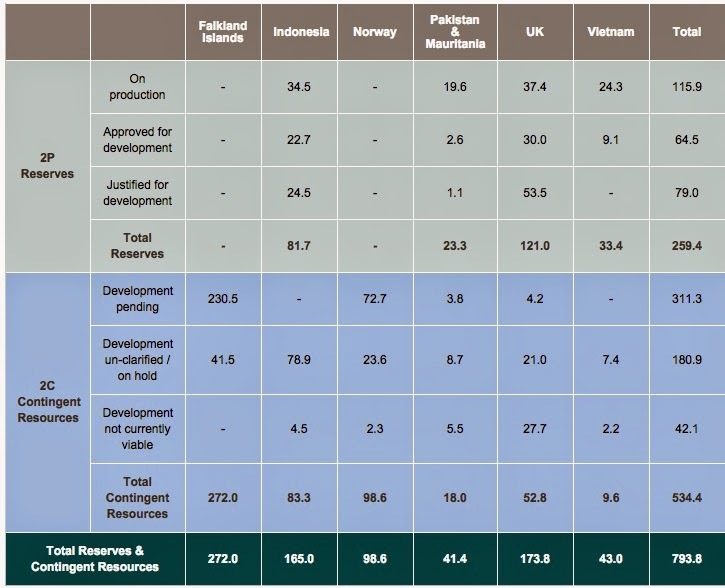 I have noted that less than stellar management performance in connection with AINV, PSEC and TICC. It applies to others as well. Incentive Fees, for what? Possibly, the decline in market prices for several BDCs this year is based on a growing recognition that the preceding record is far from admirable and certainly not worth the compensation being paid to the managers of those firms.